So you’re about to embark on an exciting but scary adventure to start your own business. There’s just one small problem: you know where you want to end up, but have no clear path to get there. Customer discovery and market intelligence will act as a compass to guide you along the road. At last week’s Entrepreneurship 101 lecture, Usha Srinivasan, vice-president of learning and insights at MaRS, discussed the steps to identifying a viable business opportunity through market research. The first step often involves making a set of assumptions, such as who your customer base will be, potential distribution channels and price points. However, Usha stressed that the most important thing you need to find is the customers’ pain point. Next you need to turn your assumptions into facts, for which you will need evidence. Evidence comes in the form of both qualitative and quantitative information, collected from primary and secondary research. While primary research may be more tedious to undertake, it allows you to gain the specific information and details required to validate your business plan and mitigate risk. Your customer discovery and market intelligence journey should include five important considerations. Once you have found your customers’ pain point and validated your assumptions, you can continue on your path to creating a viable business. 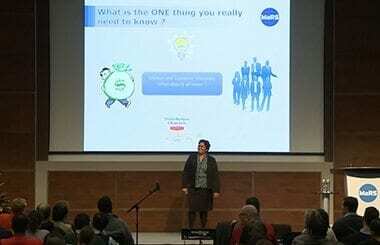 To hear about resources and tips for conducting market research, watch Usha’s full lecture. Next lecture: Marketing Communications/B2C Sales on Wednesday, January 22, 2014. Entrepreneur’s Toolkit Workshops: If you’re interested in learning how to conduct market research and implement the key principles of customer development, MaRS is offering a workshop titled Launching Customer Development in February. Click here to register.